IMAG0286, originally uploaded by f_a_h. It tasted like bacon covered in maple syrup. Only the bacon was cold and had congealed fat. So it was cold, congealed bacon fat and maple syrup. Weird. Justin has not had good success with bacon ice cream/sundaes either...and the guy is a bacon freak. I did make him browned butter, bacon, and chocolate chip cookies for Father's Day, and those were AWESOME though! Ew! 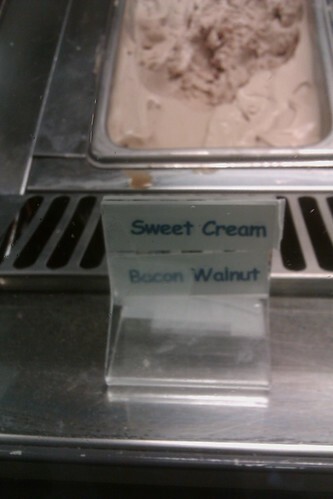 I like my bacon and I like my ice cream...just not together!